Chūichi Nagumo (南雲 忠一, Nagumo Chūichi) (25 March 1887 - 6 July 1944), was the Commander-in-Chief of the Japanese First Air Fleet, the Imperial Japanese Navy's main Carrier battle group and the man who planned the attack on Pearl Harbor. 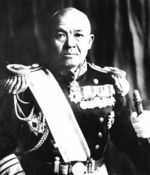 He also led Japan's early forays into the South Pacific and Indian Oceans, but his force was defeated on 4 June 1942, when during the Battle of Midway, he lost all four carriers in his battle-fleet. Despite this, he retained command of the remaining Japanese aircraft carriers up to November 1942, and led them in the Battle of the Eastern Solomons in August and the Battle of the Santa Cruz Islands in October. He was later transferred as Commander of the naval forces in the Marianas Islands and died by his own hand on 6 July 1944, during the final stages of the defense of Saipan, to avoid capture. This page was last modified on 27 June 2016, at 00:11. This page has been accessed 1,342 times.